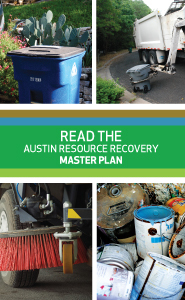 Formerly known as Solid Waste Services, Austin Resource Recovery provides residential curbside collection of trash, recycling and yard trimmings. Additional services include sweeping streets, collecting dead animals, operating a drop-off center for household hazardous waste and collecting bulk items and large brush. The City of Austin is committed to a Zero Waste goal to reduce the amount of trash sent to landfills by 90 percent by the year 2040. Zero Waste is a philosophy that goes beyond recycling to focus first on reducing trash and reusing products and then recycling and composting the rest. Zero Waste recognizes that one person’s trash is another person’s treasure, and everything is a resource for something or someone else. Our Vision: To be the national Zero Waste leader in the transformation from traditional integrated waste collection to sustainable resource recovery. Our Mission: To achieve Zero Waste by providing excellent customer services that promote waste reduction, increase resource recovery and support the City of Austin’s sustainability efforts. To change your cart size, please call 494-9400. For all other inquiries, please call 3-1-1.